In this episode, Lisa has a fun conversation with Melissa Dinwiddie. Melissa is a multi-talented, creative person who lights up your day with her voice and enthusiasm! She helps her clients to use their strengths to get their mojo back when they feel like their innovation gene has left the building. 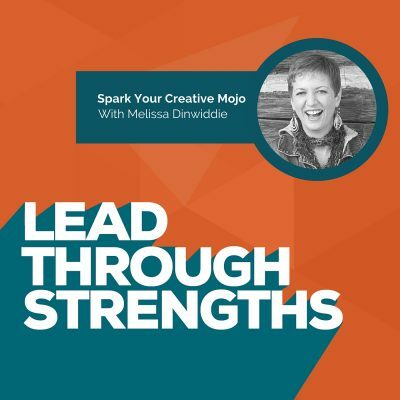 You’ll find lots of ideas to spark your creative mojo in this episode. Plus, you’ll hear about her “Passion Pluralite” life, as she calls it, so listen in. You’ll walk away with a newly formed opinion of what’s possible for a multi-passionate person. It’s inspiring to see someone who wouldn’t settle for “one thing” or one activity driving her entire career path. As she’s working with her clients, Melissa always keeps in mind her Top 5 Talent Themes from the Clifton StrengthsFinder: Connectedness, Achiever, Input, Futuristic, and Positivity. You’ll hear why this combination of Talents makes Melissa one of the most knowledgeable, multi-talented, creative people you will ever meet. Find your unique you. Melissa Dinwiddie is a multi-talented woman who has many different interests. She knows a lot about a lot of things. She always took for granted that she had so many interests, until she had a conversation with a client that led to a life-altering Ah Ha moment. In that moment, she realized that she had a unique gift, and that her Connectedness and Positivity Strengths made her a natural at consulting and collaborating with others. This led to her career working with clients to improve their creativity – which leads to innovation, increased profitability, and achievement. Use your Strengths. Connectedness and Positivity also enable her to look for meaning and connection all around her. She is always using that information to figure out how she can help her clients. Always say “Yes, and…” Improv class, which is one of Melissa’s newer hobbies, taught her to always say “Yes, and…” instead of “Yes, but…” because when you say it, you keep thing going and growing. This approach generates more new ideas, and allows for more creativity. Saying “but” is really just another way of saying no. It shuts down creativity. It leaves your team with more potential conflict and stifled creativity. Adding many ideas to the big mosh-pit brings forth more possibilities, and will empower your team members. When people are scared that they’re gonna be cut down, they become afraid to speak up (and you might be missing the best idea yet). Understand your Strengths…to overcome them. This might sound counter-intuitive, yet Melissa gives a great example when speaking about her Achiever Talent Theme. In the past, her need to achieve kept her stuck in self-perfection. By understanding how the Achiever Strength has the possibility to (counter intuitively) limit her ability to finish projects, she has developed self-compassion. She now considers herself to be a “recovering perfectionist”. So, if you tend to be a perfectionist at work, remember, everything doesn’t always have to be perfect; sometimes it just needs to get done. Give yourself a break! Lisa adds that the Achiever Talent Theme in its pure form is all about completing tasks and getting to the finish line. She hypothesizes that Melissa’s other StrengthsFinder Talents may be playing into her perfectionist tendencies too. While her Achiever wants to get things done, her Input will want to keep sponging up learning and insights that broaden her view of the project. Speaking of opening up possibilities, her Futuristic Talent will keep her in constant “what-if” mode. The fascination and vision of what can be can also keep you in rework mode. And her Connectedness Talent could have event played into her perfectionist tendencies because she sees connections and wants to share them with other people. Imagine when she’s creating courses and wants to keep tinkering so that every person with every perspective can get what they need. Ahhh, feeding your talents can be so energizing. And, sometimes, they can derail your progress if you’re not keeping an eye on the outcomes you set out to achieve. Schedule sandbox time every day. Our modern lives are super-busy, and often jam-packed with activities and projects every single day (even the weekends). Melissa suggests you spend 15 minutes every day relaxing, like you used to do as a kid. Play in the sandbox, doodle on paper, or go for a walk – whatever floats your boat. She’s proven that just that short amount of downtime can rejuvenate your creativity, and you will have a much easier time coming up with new ideas or finishing projects you’ve neglected. So schedule a short break time every day, and see what happens. Finding your “true passion” takes practice. People often ask career coaches and StrengthsFinder consultants how they can find their “true passions”. Melissa has an answer for them: Go out and try different things. She cites the example of learning to dance, another recent hobby. It took her 3 – 4 years of different types of dancing to figure out that she loves salsa and Argentine tango. In the work environment, you may be in a role you don’t love. Maybe you even hate your job. Look at the tasks your perform, and pay attention to what you actually do enjoy. Then find ways to get more of them added to your job responsibilities. If you stick with it, you’ll end up happier, more successful, and your business will be more profitable. Remember, knowing your Strengths and understanding them can have a huge impact on your personal and professional lives. So go out there and create. To connect with Melissa and grab some creativity resources, check out her website. You can also connect with her on Instagram, Twitter, and Facebook. Ready to live a full-color life? Melissa’s Live Creative Now podcast is filled with practical tips and inspiration on creativity and creative productivity. Feeding your creative hungers is one of the fastest ways to happiness, joy, and self-fulfillment. Not only will you feel more alive, it’s how you will change the world! Remember, using your strengths every day at work makes you a stronger performer. Go claim your talents and share them with the world!